In a grimy bistro on the north side of Buffalo, a few American mobsters are dining with a Canadian contact when death bursts through the door. His eyes icy, his clothes pitch black, Mack Bolan takes out every American at the table but lets the Canadian live. Andre Chebleu is an undercover operative who has come across the border to infiltrate the American syndicate, and Mack Bolan will need his help if he is going to save Canada from the mob. His endless war against the forces of the Mafia have made most of America unsafe for organized crime, so Bolan’s enemies have set their sights on Quebec, where radical separatists have destabilized the local government. Only Bolan and Chebleu can rescue Montreal from chaos and save the Great White North from becoming a living hell. 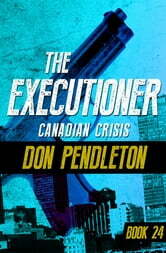 Canadian Crisis is the 24th book in the Executioner series, but you may enjoy reading the series in any order.